I put together a John Steed Facts page that will give the impression that I have a lot of free time on my hands. Well, at the time I 'did' - while watching all the episodes on video tape. Steed is one of my favorite characters - on screen and in role-play gaming. Check out my Amber pages and you will see what I mean. There are others who share my interest (see Steedophilia) in finding Steed as an Avenger or finding him elsewhere (in Crossovers). Personally, I envisioned him as a member of the royal family of Amber (from the Roger Zelazny novels), and his time was spent (as we know it) on a Cineverse Shadow Earth. In my journals, Steed lives on battling diabolical masterminds - beyond the end of the Avengers series. In this crossover, Steed is a personal investigative and enforcement agent for the crown of Amber. The question is: Who IS Steed? The following are excerpts from "The Ultimate Avengers" by Dave Rogers - 1995, regarding Steed and Mrs. Catherine Gale in the early episodes. This comparison helps to describe Steed's character and style. Steed is a thoroughly professional and efficient undercover man. His cover is that of a man-about-town with a private income. He is suave, witty, debonair, foppish even. These qualities are consciously cultivated to disarm his opponents and lull them into a vulnerable position for the kill. Steed is an expert: dedicated, ruthless, unscrupulous. His mission is all-important to him and its success is the justification of whatever methods he has used. He has been thoroughly trained in arson, burglary, forgery, explosives, codes, poisons, and murder... to name but a few. He is trained to withstand torture and brainwashing. Other than Gale, Peel, King, etc. ; there is no one working for Steed or with him, except such as may be persuaded (by any means from bribery to blackmail) to help him in a specific situation. Steed deceives people fluently and uses people callously. Steed's tastes are gentlemanly and slightly self-indulgent. He frequents the best tailor, best boot maker, best wine merchant, visits the best clubs, best restaurants, reads the Royal Edition of The Times, plays bridge, bezique, polo, croquet, etc. Steed's flat reflects the family tradition and heritage: the Hyderabad All India Polo Cup; a tiger skin; hunting trophies; a portrait of his great-grandfather Steed, etc. Most of Steed's possessions have a history or at least an anecdotal background to them. Unlike his partners, he carries no obvious symbol of his vocation such as a holster (he uses a gun infrequently). But when necessary he can produce a fund of firearms, poison capsules, time bombs, microscopic transmitters, etc. when tackling criminals he fights like a cad and uses every dirty trick in the book to knock them out with the least inconvenience to himself. 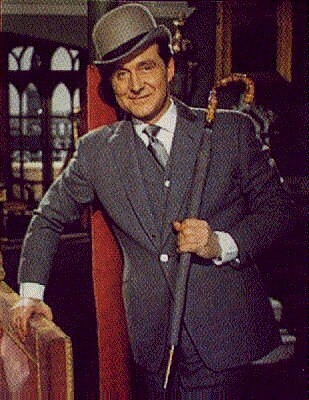 At all times (whether being menaced or menacing) Steed displays grace and charm. Avengers Forever - John Steed Biography by David K. Smith. Judith M. Galloway has "Steedophilia - the John Steed Website" and I must say, it is absolutely MARVELOUS! Steed is poised for action! Panoramic view of Steed's flat on 3 Stable Mews, from The Avengers Forever by David K. Smith.